How do the online trading platforms work? How do we handle your money? What are our different roles? About us: easyMarkets Pty Ltd (easyMarkets, us, we, our) is the issuer of the products described in this Product Disclosure Statement (PDS). Should you have any queries about this document, please contact us. Our contact details are at the start of this PDS. Structure: easyMarkets is a majority-owned subsidiary of Blue Capital Markets Ltd and forms part of the Blue Capital Markets Ltd Group which currently operates in Europe and Asia Pacific. help you to compare products. Overseas customers: This PDS is not an offer to sell or invitation to treat in relation to the products in any place in which, or to any person to whom, it would not be lawful to make that offer or invitation. The distribution of this PDS outside Australia may be restricted by the laws of places where it is distributed and therefore persons into whose possession this document comes should seek advice on and observe those restrictions. Failure to comply with relevant restrictions may violate those laws. Other documents: When you open a trading account with easyMarkets, you will be provided with a separate document titled “Terms and Conditions”. It contains terms and conditions that govern easyMarkets’ relationship with you. You can obtain a free and up to date copy of the document by contacting easyMarkets or visiting easyMarkets’ website. Retail clients: This PDS is only required to be provided to Retail Clients. If you are a Wholesale Client or Sophisticated Investor, then providing you with this PDS does not mean we wish to treat you as a Retail Client. Also, some features of our products (like Negative Balance Protection) are not available to wholesale clients. Changes to this PDS: Any information that is not materially adverse information is subject to change from time to time and may be updated by inclusion on our website (www.easyMarkets.com.au). A paper copy of any updated information will be given, or an electronic copy made available, to you without charge on request. Where this PDS includes a reference to content on our website, the relevant contents of the website referred to forms part of this PDS. If you cannot find that information on our website, you can contact us or ask via the chat function on the website. You can also ask for a copy of the statement or information without charge. be unable to settle adverse deals. easyMarkets is unable to guarantee a maximum loss that you may suffer from your trading. They are all illustrative only and are included to help you understand our products. This table provides a high-level summary of our compliance with the ASIC Benchmarks. Please swipe left and right to see complete table. easyMarkets is authorised to provide general financial product advice in relation to derivatives and foreign exchange contracts. easyMarkets is also authorised to deal in relation to those same products. This means that easyMarkets will provide you with advice which is general in nature. Whenever we give general advice (e.g. through our website, or in this PDS), we do not take into account your financial situation, personal objectives or needs. Before using the products referred to in this PDS you should read it carefully, and then consider your objectives, financial situation and needs and take all reasonable steps to fully understand the possible outcomes of deals and strategies that can be employed using our trading platforms. We recommend you seek independent financial advice to ensure that a particular product is suited to your financial situation and requirements. easyMarkets is also authorised to “make a market” for foreign exchange and derivatives contracts. This means that we set our own prices for the products we offer, including buy and sell prices. easyMarkets does not provide a market amongst or between clients for investments or speculations. Each product purchased (or sold) by you is an individual agreement made between you and easyMarkets as principal and is not transferable, negotiable or assignable to or with any third party. Step 1: Read this PDS and the Financial Services Guide (FSG). Step 2: Read, acknowledge and accept the Terms and Conditions contained on the easyMarkets website by ticking the box. Step 3: Set up a trading account with us. requires that easyMarkets maintain records of its client assessments. Trading in easyMarkets’ products involves significant risks and may not be suitable for all investors. Accordingly, prospective clients must complete a “suitability test” before they can begin trading with easyMarkets. The “suitability test” enables prospective clients to demonstrate to us that they have a sound understanding of the features and risks of our products. You will be required to complete the “suitability test” either at the time you open the account or at the time you make a deposit into your account, but always before you enter into any transaction. If you are unsuccessful in completing the “suitability test”, the results of your assessment will be recorded. If you are unsuccessful, you will not be able to trade but you will be given another opportunity to complete the test at your earliest convenience. You can contact our account manager if you have any questions about the “suitability test”. An account manager must also verify your identification before you can begin trading. established easyMarkets account before you start trading. You will be required to deposit an Initial Margin which is a percentage of the notional deal amount (typically between 0.01% and 100%), namely 25 USD (approximately 35 AUD) margin. easyMarkets will tell you what amount you need to deposit before you make the deposit. easyMarkets only accepts deposits via EFT, BPAY or via credit card to meet all margin requirements including an Initial Margin. When establishing an account, we will accept an initial deposit via credit card. We do this to enable more flexible and faster deposits. Therefore, easyMarkets will not be adopting the Opening Collateral Benchmark. Opening Collateral in this PDS is Initial Margin. You should exercise caution when using a credit card, as you will need to ensure that you have sufficient funds available to meet your repayment obligations. Step 5: You are now ready to trade. are “synthetic” in that they do not result in the physical delivery of the underlying instrument but are cash adjusted or closed by you taking an offsetting opposite position. Positions will always be closed, and your account will be either credited or debited according to the profit or loss of the deal. The money you will receive or pay will depend on whether the value of the underlying instrument you choose moves in your favour. If it does, then you will make a gain and your account will be credited. If it does not, then you will make a loss and your account will be debited. The products only require a deposit which is much smaller than the deal size (this is why the deal is “margined” or “leveraged”). Details of all the products available are contained on our website which is updated regularly. Foreign exchange option deals (see below). The day-trading zone on the easyMarkets online trading platform allows you to trade daily currency rate deals on the spot price of major currencies such as AUD/USD and EUR/USD, cross currencies such as EUR/JPY and GBP/AUD. These trades are called “day trading deals”. the day trading deal end date. Let’s assume that you believe that the AUD will rise against the USD. You want to buy USD 250,000 worth of AUD and are willing to risk AUD 1,250. You could purchase a day trading deal as follows – buy AUD and sell USD at an exchange rate of 1.0317 USD per AUD. By selecting AUD $1,250 as the amount you are willing to risk, a stop loss order is automatically generated at a rate of 1.0264. This means that AUD 1,250 is the maximum amount you can lose. At the exchange rate of 1.0317, USD 250,000 equals AUD 242,318. At the automatic stop loss rate of 1.0264, USD 250,000 equals AUD 243,570 which is within the maximum at risk amount of AUD 1,250. The exchange rate is 1.0240. In this case, the deal has been terminated at your predefined stop loss of 1.0264. You have lost AUD 1,250, the amount you were willing to risk. It is worth noting that without the stop loss, your losses would have been AUD 1,822 which is the difference between USD 250,000 converted at 1.0317 (AUD 242,318) and USD 250,000 converted at 1.0240 (AUD 244,140). The exchange rate is 1.0290. In this case, you lose AUD 635.82. This amount is the difference between USD 250,000 converted at 1.0317 (AUD 242,318.50) and USD 250,000 converted at 1.0290 (AUD 242,954.32). A forward deal offered by easyMarkets is a currency rate deal where the settlement date of the underlying currency pair is later than two working days after the date of entering the deal. Forward deals are generally used by importers, exporters and investors who seek to lock in exchange rates for a future date in order to hedge their foreign currency cash flows. However, it is not only hedgers who can benefit from forward deals. Any person may purchase a forward deal if he/she is prepared to take a risk for the possibility of making a profit or incurring a loss. The forward deal trading zone on the easyMarkets online trading platform allows you to trade over forward foreign exchange rates. If you do not close the deal, it will exist until its pre-set date of maturity, or until the stop loss, take profit or limit price reaches the pre-determined rate, whichever comes first. You cannot trade forward deals on the MT4 platform. Let’s assume that you are in the Import/Export business. You are uncertain and concerned about future fluctuations in currency exchange rates, and you have contracted to purchase inventory for the price of USD 100,000 payable in 30 days’ time. At easyMarkets you can lock in a specific future exchange rate, in order to avoid the unknown price impacts arising from exchange rate fluctuations. For example, you are worried about the increase of the USD compared to the AUD. You want to ensure the rate for a purchase of USD 100,000 at a later day, say 30 days from today (you may actually select a date that can be any business day up to three months from today’s date). You could purchase a forward deal, buying USD 100,000 and selling AUD, dated 30 days from today at USD 0.9986 per Australian dollar. You also enter a pre-defined stop loss order at say, 1.0189. The exchange rate sometime during the pre-set 30 days reached 1.02. In this case, the deal has been terminated at your pre-defined stop loss rate of 1.0189. You have lost AUD 1,995.13, the amount you were willing to risk. This amount is the difference between USD 100,000 converted at 0.9986 (AUD 100,140.19) and USD 100,000 converted at 1.0189 (AUD 98,145.06). The exchange rate at the specified date is 1.0050. In this case, you lose only AUD 637.70. This amount is the difference between USD 100,000 converted at 0.9986 (AUD 100,140.19) and USD 100,000 converted at 1.0050 (AUD 99,502.49). The exchange rate at the specified date is 0.96. You have made a profit of AUD 4,026.47. This amount is the difference between USD 100,000 converted at 0.9986 (AUD 100,140.19) and USD 100,000 converted at 0.96 (AUD 104,166.66). The commodities tab on the easyMarkets online trading platform allows you to trade Metals, Oil and Gas and Soft Commodities. These commodities are traded in a similar manner as a futures contract, quoted in US dollars and with a distinct monthly or quarterly expiry. Trading hours and the renewal details for each type of commodity product are set out on the easyMarkets website. Let’s assume that you believe that Oil prices are set to rise. Using the easyMarkets online trading platform, you enter a deal to notionally buy the US standard for Oil Trading, WTI (West Texas Intermediary). The amount that you wish to trade is 2,500 barrels of Oil at the current market price of USD 88.00. To execute this deal, you can set the maximum amount (margin) you are prepared to risk, say USD 2,500 (approximately AUD 2,497 assuming an exchange rate of 1.0010 between the US dollar and the Australian dollar). The amount of margin that you select (in this case 2,500) will determine the rate at which your stop loss order will be triggered. By increasing or decreasing this margin amount, the stop loss rate will also increase or decrease. In this example, the amount of USD 2,500 will be converted from an amount of loss you are prepared to accept, in dollar terms, to a stop loss rate set at USD 87.00. this is a guaranteed stop loss. Should the market fall to this price, your stop loss order will be triggered, and you will lose the amount you were prepared to risk (USD 2,500), no more. The Oil price falls to USD 87.00. This means the deal is terminated because your pre-defined stop loss has been triggered, resulting in a loss of USD 2,500 or AUD 2,497. At the time of expiry, Oil is traded at USD 87.80. In this case, you lose USD 500 or AUD 499.50. This amount is based on a USD 0.20 difference between the entry and exit price multiplied by the number of barrels and then divided by the exchange rate between the US and Australian currency (assuming an unchanged exchange rate of 1.0010). At the time of expiry, the Oil price is USD 89.10. In this case you have a profit of USD 2,750 or AUD 2,747.25. This amount is the difference between the entry and exit price of your deal (in this case a difference of USD 1.10) multiplied by the number of barrels and then divided by the exchange rate (assuming an unchanged exchange rate of 1.0010). You can trade indices on the worlds’ largest stock markets including the Dow Jones, FTSE, SPI and ASX 200. These indices are traded as CFDs (contracts for difference) and are cash-settled. The trading hours for each index is set out on the easyMarkets website. You can trade cryptocurrency deals allowing you to purchase a market position on a coin at market value, without actually owning the coin. That is, these deals are cash-settled. Instead of having to sell your coin to make a profit, you can simply close your position effective immediately. A buyer of your coin is not required. easyMarkets call and put options are all cash-settled. Actual physical delivery of assets (currency or commodities) never occurs. Instead, at the option’s expiry, cash is credited or debited to your free balance in the amount of the difference between the strike price and the current market value of the underlying instrument. If an option deal has no value on closing the position, often no cash is credited to your free balance. A call option deal gives the holder the right but not the obligation, to buy at an agreed upon price on expiry. A put option deal gives the holder the right but not the obligation, to sell at an agreed upon price on expiry. The agreed sell/buy price available to an option deal holder is called the strike rate. An option deal buyer will benefit if the strike rate can beat the market. If you are holding a call option deal, the strike will become more attractive as the market rises. 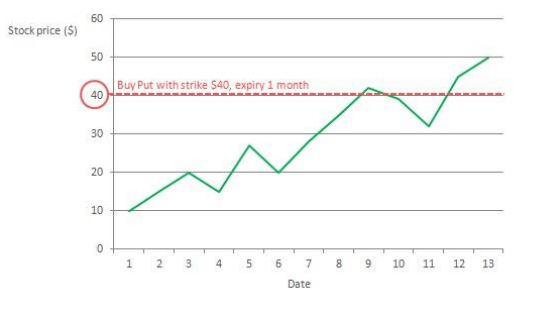 If you are holding a put option deal, the strike will become more attractive as the market falls. When buying an option deal, you pay a premium – the “open premium”. Whilst you hold an option deal, the premium value changes depending on changes in the underlying instrument’s market. The premium of a buy put deal increases as the market falls. This is because the put’s strike rate becomes more attractive relative to the market rate. The premium of a buy call deal increases as the market rises. This is because the call’s strike rate becomes more attractive relative to the market rate. The difference between the ‘premium at open’ and ‘premium now’ is your running profit and loss. If a company is trading for $50/share and you expect the share price to fall, but you do not have the confidence to short (through selling) the stock because there is a possibility you could face an unlimited amount of loss if you are wrong, you can buy a put option deal instead, giving you the right to sell at a specified price any time before the expiration date. You choose to buy a put option deal giving you the right to sell the stock at $40 over the next month. This option will cost you $5. Then, if you subtract the premium you paid for the option deal, you will have $15 profit. Under the same reasoning, you can buy a call option deal to trade a rising share price. If the price rises, the call option deal allows you to buy at a lower price than the market. the difference between your call option deal’s strike rate and the market rate is your profit (before subtracting the premium paid for the option deal). Let’s assume that you are uncertain and concerned about future fluctuations in currency exchange rates. You want to ensure a foreign exchange rate for a period of time, say 30 days from today (you may actually select a date, which could be any business day up to a year from today’s date). You could purchase an option, ensuring that you’ll be able to buy EUR 100,000 (buy a EUR call) and sell USD, for the next 30 days, at a certain pre-defined rate that you determine (strike rate), say 1.3350 EUR per USD. The premium for that option is USD 230. You have bought an option and have ensured the exchange rate of 1.3550 for the period ending 30 days from today. Nothing can change that. Such assurance has cost you the original USD 230 premium you have paid. The option ends when you either materalise (or exercise) the pre-defined rate, sometime during the “open” period, or at the end of the pre-defined period (the maturity or expiration period). the spot rate is 1.3736. You realise a profit of USD1,507 (net profit of USD 1,277 after deducting the premium of USD 230). The spot rate is 1,3132 (actually any rate lower than your strike rate of 1.3550). You lose the premium you paid of USD 230.
maturity, there is little or no time value. easyTrade is a simplified version of an option deal which was developed by easyMarkets and is tradable only in easyMarkets’ proprietary platforms (it is not available on the MT4 platform). easyTrade allows you to nominate a defined maximum risk amount and trade a buy or sell, for 1 hour, 3 hours or 6 hours in duration with the ability to close the trade out at any time before expiry. The cost of trade is similar to a ‘spread’ and is a variable amount based on the volatility of the underlying market. easyTrade can be used to trade in the foreign exchange, indices, commodities and cryptocurrency markets. Each deal using the easyMarkets online trading platform must have a stop loss order set. Your position will automatically be closed out when the stop loss order is reached. We will deduct the resulting realized loss from your remaining funds held by us. You will remain liable for any negative positions which cannot be covered by the closing out of your positions. You do not have to set a stop loss order when using the MT4 platform. If you are using the MT4 platform provided by easyMarkets, then your margin obligations will differ from easyMarkets’ web-based platform. If the equity balance in your account falls below 70% of your margin requirement, you will automatically be notified of a margin call. At 30% of your equity balance, the MT4 system will automatically start liquidating positions with the largest losses closed first in order to free up additional margin. This process is electronic and easyMarkets does not actively monitor your positions or account. In addition, easyMarkets may change the margin requirements at its discretion during periods of increased volatility. This section sets out easyMarkets’ policy on margin calls. You will be subject to margin obligations. You will only be allowed to deal in and maintain positions on the basis of cleared funds being provided to meet your margin obligations. Initial Margin means the initial deposit (an upfront payment) of funds required by us to cover the risk to easyMarkets, and as security for your obligations. In the case of forward deals, the initial margin immediately payable is determined by easyMarkets to be between 2% – 5% of the face value of the deal. You must be in a position to fund such requirements at all times or your position may be closed by easyMarkets when the floating value of your account reaches zero. Additional margin (also known as variation margin) may be payable in the event of adverse market movements to keep the position open. easyMarkets monitors floating positions on a real time basis to account for market movements. If the value of a position moves against you, you will be required to ‘top up’ the Initial Margin and, if so, you will be subject to a margin call i.e. to pay additional margin (automatically from your easyMarkets account). Margin calls can be made by us by phone, email or SMS, or in the case of clients using the MT4 platform, the margin call is made electronically via the MT4 platform when the ‘terminal bar’ flashes red (If the equity balance in your account falls below 70% of your current margin requirement). You are responsible for ensuring margin calls are met. In the MT4 Platform, the total open positions are netted across the account to give a single account margin position. This means that a floating loss from one trade can be offset by a floating profit in another trade and vice versa. Margin calls in the MT4 account are made across the account position ‘as a whole’, as described above. In the easyMarkets Web Platform however, Margin calls and forced liquidations are be made on a ‘per transaction’ basis. This means that should you have several open positions, then margin calls are performed on each exposed position and not netted across the group of open transactions. In other words, the unrealized profits of one transaction cannot be used to offset the unrealised losses of another transaction. easyMarkets will take reasonable steps to notify you with a margin call, before we close out your position. These steps may include contacting you by phone, SMS or email. However, individual Clients are ultimately responsible for ensuring that their accounts are adequately capitalized, to avoid margin calls or forced liquidations during market fluctuations. easyMarkets has the right to limit the size of your open positions, whether on a net or gross basis under any circumstances as determined by easyMarkets. easyMarkets also has the right to refuse any request made by you to place an order to establish a position at any time at easyMarkets’ discretion without having to give you notice. Stop loss is an order placed to close an open position when it reaches a certain unfavourable price. A stop-loss order is designed to limit your loss on a position. You must set a stop loss order for each deal using the easyMarkets online trading platform. Take profit is an order placed to close an open position when it reaches a certain favourable price. A buy limit order allows you to specify the price that you are willing to pay for a product. When the underlying instrument’s price reaches the level you set, a buy order will be performed. This is used when the price is falling, and you believe it will reach a price and increase. A sell limit order allows you to specify the price that you are willing to offer/sell a product. This opens a sell order when the underlying instrument’s price reaches the level you set. This is used when you believe the price, after increasing, will reach a level and then reverse and drop. A buy stop order allows you to set the price at which you would like your position to open at. This type of order can be used when the current price is lower than the price you set. This is used when you believe the price will reach a certain level and continue increasing. Much like a buy stop order, a sell stop order allows you to open a position at a predetermined price level. This type of order can be used when you believe the price will reach a level and continue falling. Your trading account with easyMarkets is normally denominated in a “base currency”, for example AUD. Sometimes, for you to trade, you may need to convert existing funds into USD or another base currency. You can use your own bank to convert your existing funds, if you wish. Your bank may charge you for this service. If the Base currency differs to your deposited currency, easyMarkets will convert the currency when you open a position and again when you close it. When it does this it issues a foreign exchange contract to you. easyMarkets provides its own online trading platforms and MetaTrader 4 Platform (MT4 Platform), enabling you to trade with its products. When you use our MT4 trading platform, you may “plug in” other third-party applications. The use of those applications can carry significant risk. We do not take responsibility and will not indemnify you from any loss incurred in connection with third party plugins that you choose to use, regardless of whether or not we know about them or approve them. You can use easyMarkets’ products to hedge your exposures to the underlying instruments. Any profit (or loss) you make using easyMarkets’ trading facilities could be offset against the higher (or lower) price you physically have to pay for the currency, index, commodity or other instrument at the future date. You can benefit by using the quoted underlying instrument prices offered by easyMarkets to speculate on changing price movements. Speculators seek to make a profit by attempting to predict market moves and buying a product that derives its value from the movement of an underlying instrument. When using easyMarkets’ online trading platforms you gain access to systems which are constantly updated in real time. You can control your account and positions 24 hours a day. easyMarkets’ online trading platforms provide real time quotes. You may check your trading accounts and positions in real time and trade based on real-time information. When you open a limit order you set your preferred exchange rate for a deal. When and if the market rate reaches the rate you defined, easyMarkets will automatically execute the deal for you. Similarly, if you have an open position but are not currently accessing the trading platform, you can set a take profit at your preferred rate. When and if the market price reaches the rate you defined, easyMarkets will automatically close out your open position for you to realize a profit. easyMarkets offers a risk management tool called dealCancellation. For a small fee, you can select this feature upon opening a deal on the web-based trading platform. If the price moves against you, you can cancel the deal within the hour and have the loss amount returned to you. In addition, if you selected to use dealCancellation when opening your deal and the price moves aggressively so that your stop loss order is executed resulting in the total loss of your margin, easyMarkets will return the loss amount as if you had selected to use dealCancellation. You can only purchase dealCancellation at the time of opening a deal. It cannot be renewed when exercised or expired. easyMarkets reserves the right to disable the dealCancellation feature at its discretion and at any time without prior notice. Inside Viewer is a market analysis tool which shows the trader the percentage of easyMarkets traders which are buying and selling a specific instrument (instrument must be loaded into the trading platform). Freeze Rate is a trading tool easyMarkets offers which allows you to freeze the price you see for a few seconds to prevent a price change before you execute your trade. These few seconds can make a significant difference in volatile and fast-moving markets such as the Forex and Cryptocurrency markets. A guaranteed stop loss or “GSL” order is an order that, once executed, limits your absolute worst-case scenario (loss) when trading any products with easyMarkets. It is designed to enable you to quantify the exact amount you are prepared to risk i.e. the amount you are prepared to lose on any particular trade. The amount may be selected in dollar terms or you may select a rate. Where you select a dollar amount, this will automatically be converted into a stop loss rate to enable the GSL order to include a rate. A GSL order is useful in limiting your loss, particularly if you are trading a market that has a tendency of “gapping”. If the market “gaps” through your GSL order level, then we guarantee that your position will be closed out at the amount (or rate) specified by you. We guarantee this on the basis that we have implemented systems and procedures that will automatically close out a position when the value of the loss reaches the amount specified by you or the rate specified by you. This means, that in all cases where you use the easyMarkets online trading platform (and not the MT4 Platform) you will not suffer any slippage (slippage is the difference between the order price at which a trader expects his deal to be filled or executed, and the price at which they are actually filled). After opening a deal, you can reduce your GSL order to a maximum price that is 0.2% away from their original entry price and thereby minimize their potential loss. If you purchase EUR/USD at 1.3550 you will be able to adjust your GSL order to a price of 1.3520 and thereby minimize your potential loss should the market move against you. Further, if the market moves in your favour and rises to say 1.3590, you will be able to adjust your GSL order to 1.3560 which is above your entry price of 1.3550 and therefore guarantee a profit on the deal should the market fall back to 1.3560 and you have not amended your GSL order. A GSL order will be executed either at the exact exchange rate or the exact amount of loss declared by you. This transaction will be executed as soon as the distinctive (“indicative”) exchange rate, including easyMarkets’ spread, is either identical to the order given by you, or indicates an identical amount of loss (in dollar terms) declared by you. Let’s assume you open a deal to buy AUD against the USD. The amount you decide to trade is AUD 50,000 at 0.9980. At the time that you enter the deal, you also place a GSL order at a rate of 0.9940 ensuring that your maximum loss will be AUD 401.81. Should the AUD fall against the USD and the price reaches 0.9940, the GSL order will be executed and you will incur a total loss of AUD 401.81. In addition, should the market gap for some reason (either due to economic or major political news) your loss will still only be AUD 401.81 since easyMarkets will ensure the GSL order at the best price available and we guarantee your GSL order rate of 0.9940 by only booking a loss of AUD 401.81 to your trading account. Let’s assume you have your GSL order at 0.9940 and your personal spread is 4 pips. If the spread provided to easyMarkets by its liquidity provider is buy 0.9941 and the sell is 0.9943, then we will determine the mid-rate to be 0.9942. Since your spread is 4 pips, that would mean that your personal spread would be 2 pips on either side of the mid-rate and therefore your buy rate is 0.9940 and your sell rate is 0.9944. If the rate of 0.9942 is then traded or easyMarkets’ liquidity provider shows us a sell rate of 0.9942, we will execute your GSL order of 0.9440 taking into consideration your personal spread. This forms the basis of our GSL order feature. easyMarkets enables you to make transactions in small amounts. You can start using easyMarkets even with an Initial Margin as little as USD25. When trading with easyMarkets, you can deposit an amount that is in line with the amount you are willing to risk. The spreads in easyMarkets’ trading platform assume deals of small, up to medium amounts. If you are a frequent user of the easyMarkets platform and wish to trade with medium up to large amounts, please contact us by email or telephone to enable us to provide you with tailor-made trading conditions. There are a number of risks in trading the products offered by easyMarkets. These risks may lead to unfavourable financial outcomes for you. Monitoring of any risks associated with our trading facilities is your responsibility. You should not use our services unless you fully understand the products, and the benefits and risks associated with them. In unforeseen and extreme situations, easyMarkets reserves the right to suspend the operation of its website and online trading platforms or any part or sections of it. In such an event, easyMarkets may, at its sole discretion (with or without notice), close out your open positions at prices it considers fair and reasonable at such time. easyMarkets may impose volume limits on your accounts, at its sole discretion. Products traded on easyMarkets online trading platforms are subject to many influences which may result in rapid fluctuations. Given the potential levels of volatility in the markets, it is recommended that you closely monitor your transactions at all times. Because of this market volatility, no product offered by easyMarkets can be considered a safe trade. However, easyMarkets offers you a way of managing volatility by working orders. You can reduce downside risk by the use of stop loss orders where easyMarkets will attempt to close your position if the price reaches a particular level. In addition, you may also use take profit orders which allow you the opportunity to benefit from favourable upside market movements. Take profit orders are like stop loss orders but lock in profits rather than losses. A pending order is an instruction by you to easyMarkets to buy or sell a product at a specific price above or below the current market price. You leave such orders with us to take advantage of favourable price movements that may occur when they may not be able to monitor the rates themselves or during overnight markets when they are asleep. Similarly, to guarantee stop loss orders, you can specify an amount, in dollar terms, at which point you wish to realise a profit or you can specify a rate. If you chose to specify a dollar amount, this will automatically be converted into a rate to enable the limit order to include a rate. Note: when trading in the MT4 Platform, pending orders may be subject to slippage. denominated in the base currency of your account (i.e. AUD). You are exposed to currency risk as the unrealized profit or loss from your transaction will be affected by fluctuations of foreign exchange rates. easyMarkets’ products involve a high degree of leverage. You can outlay a relatively small initial margin which secures a significantly larger exposure to the underlying instrument. The use of products like this magnifies the size of your trade, so your potential gain and your potential loss is equally magnified. You should closely monitor all of your open positions. Leverage increases the risk that even small adverse movements in the value of the underlying instrument can lead to losses. Counterparty (or credit) risk is the risk that derives from a counterparty’s inability to perform all or any of the obligations under a contractual agreement. We have adopted a policy to manage our counterparty risk that derives from client deals. easyMarkets limits this exposure by hedging its exposure to its clients by entering into opposite transactions as principal in the wholesale market. easyMarkets is then exposed to counterparty risk with that hedging party. The products in this PDS are not protected by a licensed exchange, also known as a central counterparty. Instead, the products are called over-the-counter derivatives. This means you contract directly with us, and you are subject to our credit risk. If we become insolvent, we may be unable to meet our obligations to you, in which case you will become an unsecured creditor. You can assess our financial ability to meet these counterparty obligations to you by reviewing financial information about easyMarkets. You can obtain a free summary of our annual financial statements by contacting us using the details at the start of this PDS. We have adopted a policy in order to manage counterparty risk. To hedge risk, easyMarkets enters into back-to-back hedges with its parent company, Blue Capital Markets Limited. You are reliant on easyMarkets’ ability to meet its counterparty obligations to you to settle the relevant deal. easyMarkets limits this exposure by hedging its exposure to its clients by entering into opposite transactions with its parent company, Blue Capital Markets Ltd, i.e. on a back-to-back basis. Thus, there is a limited risk to easyMarkets. In turn, Blue Capital Markets Ltd centrally manages the exposure it has to easyMarkets and other entitles by aggregating its exposure and internally offsetting client deals with each other. Any net exposure of Blue Capital Markets Ltd is then hedged with one or more of its liquidity providers. These liquidity providers are chosen based on their ability to provide liquidity in the underlying market as well as the strength of their balance sheet. easyMarkets has a written policy detailing how we monitor our compliance with our licence conditions in relation to financial requirements. easyMarkets undertakes stress testing to ensure it holds sufficient liquid funds to withstand adverse market movements. easyMarkets maintains sufficient financial resources to meet its financial obligations to its clients. This is met through the use of a financial buffer that historically has been the equivalent of all of our client’s exposure in the forex market. You should satisfy yourself that easyMarkets is able to meet its obligations to you. you can assess easyMarkets’ ability to meet its financial obligations by reviewing a summary of its financial statements. An account with easyMarkets is not insured or guaranteed by the Australian government or any other entity. Consequently, should we become insolvent, there is no guarantee that your account will maintain its value. easyMarkets relies on technology to provide our trading platform to you. easyMarkets relies on Blue Capital Markets Limited group to ensure the systems are updated and maintained. A disruption to the easyMarkets trading platform may mean you are unable to trade in any of the products offered by easyMarkets when you want to and you may suffer a loss as a result. An example of disruption includes the “crash” of the computer systems used to operate our trading platform. It is possible that you enter into a deal with us and the underlying instrument moves in your intended direction, but you still end up with less than you started after closing your position. This can happen because of the combined effect of the spread between bid and offer prices, and the negative rollover interest which could apply on consecutive days that a position is held open. You are responsible for providing and maintaining the means by which you access our website. These may include, without limitation, a personal computer, modem and telephone or other access system available to you. While the internet is generally reliable, technical problems or other conditions may delay or prevent you from accessing our website. If you are unable to access the internet and thus, the easyMarkets online trading platform, it may mean you are unable to trade in any product offered by easyMarkets when desired and you may suffer a loss as a result. In the event of an underlying instrument being suspended, no new positions can be opened where there is a trading halt over the underlying instrument or trading in the underlying instrument has been suspended on the relevant exchange upon which the underlying instrument is listed. approved by us, and others are not. Regardless of our approval, we are not responsible for, and will not indemnify you from, reliance on any statements made by their makers or promoters, or any loss incurred in connection with third party plugins that you use. Some are offered by fraudulent or illegal/underground entitles in remote parts of the world. If promoters of these plugins make promises that are too good to be true, then you should avoid them. You should never provide your account user name or password to a third party – to do so would be a breach of your contract with us. You are wholly responsible for managing the risks (including the risk of loss) associated with using third party plugins. In some conditions it may be difficult or impossible for you to close out a position. This can happen, for example, when there is a significant change in the price, value or rate of an underlying instrument over a short period of time. This may give rise to substantial losses. Further, in some conditions you may not be able to open a position if, for example, there are not enough trades being made in the market for the underlying instrument. Once you have locked in your price you will not be able to take advantage of subsequent favourable rate/price movements (should that occur) in relation to your existing position. On the other hand, you will be protected from any future adverse movements. If prices move against your position, you will be required to top up your account with sufficient funds to maintain your position. If you fail to maintain the required account balance, your position will be closed out by easyMarkets with resultant loss. You could sustain a total loss of the net amount that you deposit with easyMarkets to establish or maintain a position (including “top up” amounts). Our Negative Balance Protection means that if a Retail Client’s free balance drops below zero, we will negate any negative balance and return their free balance to zero. easyMarkets may make available to you through one or more of its services, a broad range of financial information that is generated internally or obtained from Third Party Providers. This includes, but is not limited to financial markets data, news, analyst opinions and research reports, graphs or data (Market Information). Market information provided by us by email or through our website is not intended as advice. We do not endorse or approve the Market information and we make it available to you only as a service for your own convenience. easyMarkets and its Third Party Providers do not guarantee the accuracy, timeliness, completeness or correct sequencing of the Market information or warrant any results from your use or reliance on the Market information. Market information may quickly become unreliable for various reasons including for example, changes in market conditions or economic circumstances. Neither easyMarkets nor the Third-Party Providers are obligated to update any information or opinions contained in any Market information, and we may discontinue offering Market information at any time without notice. The products offered by easyMarkets are OTC products and are not traded on a regulated exchange. This means they are not covered by the protections for exchange-traded products arising from domestic or international exchange rules (such as guarantee or compensation funds). easyMarkets is authorised to “make a market” for foreign exchange and derivatives contracts. This means that we set our own prices for the products we offer. The prices we set may diverge significantly from the market price of the underlying instrument. Further information about how our prices are derived is set out in section 12 of this PDS. If the market moves against you and you lose on a deal, we may directly benefit from that deal. Gapping occurs where the price of a product moves quickly, and sometimes may even skip one or more price points. This may mean that a position is closed below your Stop Loss order thereby increasing your loss. There may also be a time lag between when you seek to open or close a deal and when that deal is actually opened or closed (“execution risk”). This could result in the deal being opened or closed at a worse price than when you sought to open or close the deal, especially where the market for the underlying asset is volatile or illiquid. a material breach of the Client Agreement occurs. You should read the Client Agreement carefully. easyMarkets does not charge fees or commissions for you to trade any of its products. easyMarkets acts as a market maker and makes its earnings from the spreads that are embedded in the product prices. The spread is the difference between the rate at which we buy and sell the underlying instruments and the rate that we quote to you. Different spreads are used depending on the value of the transaction, the markets traded and the type of account as selected by you. easyMarkets earns its income from the spread that we apply to our products. easyMarkets offers a fixed spread model, therefore your transactions cost will not vary under any changing markets conditions. The calculation of the price to be paid (or the payout to be received) for products offered by easyMarkets, at the time the deal is purchased or sold, will be based on the mid-rates received by our pricing providers. The calculation will include a spread in favour of easyMarkets and may differ from prices available in the primary or underlying markets where the underlying instruments are traded. Where you open a position, you will be required to pay an Initial Margin and may be required to pay additional margin in the event of adverse market movements against your position to keep your position open. Such payments are not costs but are funds required by easyMarkets to cover our risk, and as security for your obligations. The margin amounts are payable into the easyMarkets client trust account and are held, used and withdrawn in accordance with the Corporations Act 2001 (Cth) requirements and the Terms and Conditions. All interest that may accrue on the client trust account is kept by easyMarkets. Deal payouts shall be determined by easyMarkets by reference to the daily values reported on our website as provided by our pricing providers. easyMarkets reserves the right to make corrections to such data in the event of mispriced or typographically incorrect data. Rollover fees or interest refers to an amount paid to easyMarkets, or to the client when you hold your position open for a certain length of time. Whether you pay or receive interest, we receive a percentage of that amount. The method of calculation varies depending on the underlying instrument. You will be charged (or receive) a fee when ‘Rollover’ occurs, if you are holding an open day-trading deal. This fee/payment is detailed within the trading platforms and takes place every night at 22:00 GMT. If at 22:00 GMT, you do not have sufficient funds in your free balance to meet this fee, you will receive an email notifying you of this unpaid rolling fee. You are then required to deposit funds within 24 hours to meet this payment. If payment is not made after 24 hours, easyMarkets will close any open positions starting from the ‘least profitable’, to collect the unpaid rolling fee. ‘Least profitable’ is defined as the (profit or (loss) of the position ÷ the margin) × 100. 13. How do the online trading platforms work? You must first set up an account with us – see the heading “Opening an Account” above. A precondition to successful registration is an acknowledgement by you that you have read this PDS, the FSG and that you have read and agreed to be bound by the terms and conditions. Another precondition is that you meet our client qualification criteria and successfully pass our Client Suitability Test. There may be other terms and conditions that you will need to agree to if you are outside of Australia. Once you are registered, you will be able to login online to your user account using your username and password. Once logged in, you can begin trading with easyMarkets using the online trading platform. Once a deal has been executed, you will receive an electronic confirmation from easyMarkets giving you details of the transaction. 14. How do we handle your money? The funds in your account will be held in a trust account until you enter a deal or withdraw your funds. Funds deposited by our clients are segregated from our money and held in a pooled trust account in accordance with Australian law. This section explains our client money policy, including how we deal with your money and when we make withdrawals from your account. It also mentions the counterparty risk associated with the use of your money. By using easyMarkets’ services, you relinquish the right to any interest on funds deposited in easyMarkets’ designated client money accounts. Individual client accounts are not separated from each other but are pooled together. The money is held on trust for you until you withdraw the money or otherwise provide us with a legal right to that money because of open positions, outstanding fees owed to us or in such other circumstances as referred to in the client agreement, which is set out on easyMarkets’ website. If you are a Retail Client or a Sophisticated Investor, we cannot use your client money for our own capital purposes, or to hedge with our liquidity providers. We use our own funds, and we may use Wholesale Client funds for these purposes, subject to our terms and conditions. We typically hold the equity balance displayed in your account in our client money account. Any fees or other amounts we are entitled to. Sometimes there may be a discrepancy in the balance shown to you via the online trading platform, and the amount of client money we hold. That may be because of pricing feed error, uncleared funds, software malfunction, if we have extended credit to you, or if we otherwise take action under our terms and conditions which may include freezing your account if you, say, breach the terms and conditions. You can ask us for records about money we have received from you, on your behalf, or for your benefit, where that money was client money. We will provide you with the records within 5 business days or such longer period as we may agree to in writing with you. There is also a counterparty risk that you may lose some or all of your money if there is a deficiency in the designated segregated account. See the section above titled “Significant Risks” for more information concerning counterparty risk. This is a simplified example and disregards any fees or charges which may apply. You open an account and deposit $10,000. easyMarkets deposits the $10,000 in its client money account. The balance of the client money account is $10,000. You decide to open a position to buy Gold. Our quote is 1,680.10/1,680.70. The value of a movement from 1,350.10 to 1,351.10 is USD 10.00 as a minimum size is 10 ounces of gold. You open a transaction to buy 5 contracts at a price of USD 1,680.70 per ounce. This represents a notional value of USD 84,035 (being buy price (USD 1,680.70) x USD 10 x 5 (number of contracts). Let’s say the margin obligation is the equivalent of AUD 4000. As counterparty to the transaction, easyMarkets sells 5 contracts to you at a price of USD 1,680.70.
easyMarkets hedges its exposure with its parent company by buying 5 contracts in its name at a price of USD 1,680.70 and would therefore have a margin obligation to its parent of say AUD 4,000.
easyMarkets uses its own money to meet its hedging obligations and the balance of the client money account is still $10,000. You continue to hold an open position. The underlying price of Gold has decreased, and our quote is 1,640.20/1,640.80 on day five. The notional value of your open position is now USD 82,010 (being sell price (USD 1,640.20) x USD 10 x 5 (number of contracts). Thus, theoretically your margin obligation has increased by USD 2,025 (being the unreaslied loss on the open position – USD 84,035 less USD 82,010 = USD 2,025) which at an exchange rate of 1.01 equals AUD 2,106. Similar to day 2, easyMarkets uses its own money to meet its hedging obligations and the balance of the client money account is still $10,000. You enter into a transaction to close the open position (by selling 5 contracts to easyMarkets at a price of USD 1,630.20) and realise a loss of USD 2,525 (as you had originally bought at a price of USD 1,680.70) which, at an exchange rate of 1.04 equals AUD 2,626. Your account would be debited with the AUD 2,626 loss reducing the account balance to AUD 7,374. At this point easyMarkets is entitled to the AUD 2,626 which you have lost. The current balance of the client money account is AUD 10,000 of which you are entitled to AUD 7,374 and easyMarkets is entitled to AUD 2,626.
easyMarkets transfers $7,374 to Client A from the client money account. You are exposed to the risk that you may not receive all money owed to you if there is a deficiency in the client money account, and easyMarkets becomes insolvent or otherwise unable to meet the deficiency. Provided easyMarkets remains solvent, it will pay from its own funds any shortfall which arises. If you are an MT4 user, easyMarkets may withhold any payment of funds if we reasonably consider that the funds may be required to meet any current or future margin requirements on your open positions. www.easyMarkets.com.au and must be read and agreed to before a contract is entered into. If you are outside of Australia, there may be other terms and conditions you will be required to sign or acknowledge. Information in this PDS is subject to change from time to time and is up to date as at the date stated at the start of this PDS. There is no cooling off period for any product offered by easyMarkets. Once you have deposited funds into your trading account AND initiated a deal, you are no longer entitled to a refund unless you close the deal. In that case, you are only entitled to the remaining balance of the account after realising a profit or loss on the deal. You must provide all information to us which we reasonably require of you to comply with any law in Australia or any other country. In particular, you must provide adequate identification before you can use our products or services. We may disclose any information that you provide to a relevant authority where required by any law in Australia or any other country. We may delay, block or refuse to enter, adjust or complete a transaction if we believe on reasonable grounds that making the payment may breach any law in Australia or any other country, and we will incur no liability if it does so. Unless you have disclosed to us that you are acting in a trustee capacity or on behalf of another party, you warrant that you are acting on your own behalf when obtaining services from easyMarkets. When you use easyMarkets’ services, you are promising that you will not breach any law in Australia or any other country. easyMarkets reserves the right to suspend the operation of our website and online trading platform or any part or sections of them. In such an event, we may, at our sole discretion (with or without notice), close out your open positions at prices we consider fair and reasonable. At its sole discretion, easyMarkets may impose volume or other limits on your accounts. We offer telephone customer and dealing support 24 hours per day, 5 times a week (24/5). When providing instructions by telephone, you will need to provide us with adequate identification information. The products offered by easyMarkets can create tax implications. Generally, if you make a gain attributable to an exchange rate or price fluctuation, then that part of the gain is included in your assessable income. Conversely, if you make a loss attributable to an exchange rate or price fluctuation then part of the loss is deducted from your assessable income. However, the taxation laws are very complex and vary depending on your personal circumstances and the purpose of your trading. Accordingly, you should discuss any taxation questions you may have with your tax adviser before using our products or services. 18. What are our different roles? easyMarkets is the product issuer. This means we issue the products described in this document, and do not act on behalf of anyone else. easyMarkets is also the service provider. Our website (and at times, our Representatives) can give you general advice and help you use the trading services. 19. What should you do if you have a complaint? In the event you have a complaint about us, you can contact us and discuss your complaint. If you are overseas, easyMarkets may refer you to an overseas dispute resolution body which gives you rights in addition to your rights in Australia. If your complaint is not satisfactorily resolved within six weeks, please contact us by telephone or in writing, using the contact details in this PDS. We will try and resolve your complaint quickly, fairly and within prescribed time limits. If the complaint cannot be resolved to your satisfaction, you have the right to refer the matter to the Australian Financial Complaints Authority (AFCA) which is an external dispute resolution service of which easyMarkets is a member. You can contact AFCA on 1800 931 678 (if in Australia) or +61 1800 931 678 (if outside Australia) or in writing at GPO Box 3, Melbourne, Victoria, 3001, Australia. You can also contact AFCA through their website: www.afca.org.au. Base currency refers to the currency in which your trading account is denominated, and also refers to the currency on the left of a quoted trading pair. Any profit or loss on a deal is converted into the base currency. (including dealings in foreign exchange) in the two host countries of the relevant currency pairs, or in the case of CFDs, the relevant exchange time to where the CFD is being traded. Client agreement refers to the terms and conditions that you are required to agree to before you can use the products described in this PDS. They are incorporated by reference into the PDS. You can obtain a free copy of this document by contacting us using the details at the start of this PDS. automatically closed, crystalizing any ‘floating profit or loss’. A new position must be opened to reestablish a position after the contract expiry. Contract for Difference (CFD) refers to an agreement to pay or receive the change in value of the underlying instrument (e.g. a currency pair, share index or commodity) depending on whether the price rises or falls. EUR refers to the Euro – the official currency of the European Union. FSG refers to the Financial Services Guide issued by us. Initial Margin is the initial deposit required by you before you can trade with us. Leverage refers to the ability to pay only a small amount of the value of a currency as an initial payment to open a deal. Also known as “gearing”. Pending Order includes a buy limit order (see section 7.3), a sell limit order (see section 7.4), a buy stop order (see section 7.5) and a sell stop order (see section 7.6). Negative balance protection is a risk management tool for Retail clients whereby if a losing deal results in your account having a negative balance, easyMarkets will negate the negative balance and return the free balance in your account to zero. Pips means 100th part of a per cent (e.g. 0.0001 of a unit). Movements of exchange rates are usually in terms of points. Stop Loss order has the meaning set out in section 7.1. Representative includes a director or employee of easyMarkets, and a director or employee of any company related to easyMarkets, as well as any other entity that is appointed as an authorised representative of easyMarkets. Retail Client means a customer or a potential customer of easyMarkets who is not a Wholesale Client or a Sophisticated Investor. Sophisticated Investor means a person who would be a Wholesale Client only through the application of section 761GA of the Corporations Act 2001 (Cth). This requires the person to sign a special Sophisticated Investor letter. Take profit order has the meaning set out in section 7.2. Third party providers means agents, vendors or parties from which easyMarkets obtains a broad range of financial information to make available to you through one or more of its services. USD refers to the United States dollar. Wholesale Client has the same meaning as in section 761G of the Corporations Act 2001 (Cth) but does not include a Sophisticated Investor.